Call Us On 04 281 3630 HAPPY EASTER! We deliver flowers same day when ordered before 12pm NZST, orders received after this time will be delivered the next working day. 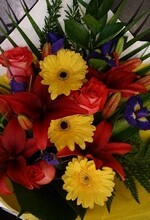 We deliver flowers Monday to Saturday. Orders received for a Sunday it will be delivered the next working day.